The hottest new trend in outdoor living features is an outdoor kitchen. Evergreen Landscape & Design specializes in outdoor kitchen design and installation. Colorado outdoor kitchens are amazing features within any outdoor living space. Outdoor kitchens truly bring the indoors out like no other element in the landscape. What chef’s paradise would be complete without and outdoor kitchen with a view? Outdoor kitchen spaces can be customized to fit cooking or entertaining style. Outdoor kitchens can be as simple as a single grill, or can have grills, side burners, refrigerators, icemakers, cooled or heated serving stations, kegerators, sinks, customized lighting, or whatever else our imaginations can dream up. Covered outdoor kitchen areas can be useful on days where weather is not ideal or to protect the area from direct sunlight on hot Colorado days. Our goal is to design an outdoor kitchen space that will accommodate your cooking and entertaining needs, while providing great usability and access, all while adding an attractive element and focal point to the overall landscape design. We frame outdoor kitchens with masonry block, which is then covered in stone or stucco to finish. If an outdoor kitchen is installed on a deck and requires much lighter construction, we can build a custom outdoor kitchen frame from welded aluminum. The custom outdoor kitchen’s aluminum frame can then be finished with lighter cut stone or stucco. Another feature we have found as particularly enjoyable in an outdoor kitchen, is a pizza oven. Custom outdoor pizza ovens require particular skill with design and installation, and we have built both gas and wood burning outdoor pizza ovens. 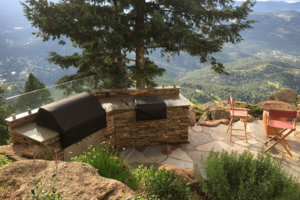 Whether you’re aiming for the rustic mountain look, or a more formal setting, let Evergreen Landscape & Design help you design the perfect outdoor kitchen for Colorado living.